Training Templates for Excel (Microsoft Excel Solutions) is a package designed to provide a fast path to acquiring the key skills to utilize Excel in the most efficient manner to common and everyday business problem solving. Training templates for Excel are accompanied by a detailed training eBook to cobine reference material with hands on examples and exercises. The Excel templates are populated with text boxes detailing the logic behind calculations and explanations on how to create more advanced applications of the same concept. Training focuses on key skills required for everyday business use and commonly required professional skills. Combination of text and template material enables convenient access to required training and examples as well as efficient work flow. 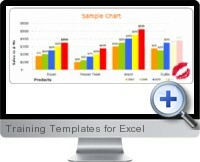 Training material is easy to understand and suitable for Excel beginners through to advance users. Excel templates contain explanatory text with detailed training information and potential solutions for specific analytic needs. Training material and templates are ideal for both professional use and educational purposes.